This image shows a 3-pound bag of banded amethyst tumbling rough, dumped into a colander and sprayed with water to reveal its full color. Click on the image for a larger view. Wow! We are selling three-pound bags of banded amethyst, specially sized for rock tumbling. Each three-pound bag contains mostly pieces that are between one inch and two inches in size. The exact size varies from bag to bag. There are usually about ten to twenty pieces per pound. This material consists of beautiful purple amethyst, white milky quartz, and a small amount of gray smoky quartz. These three materials are banded with one another into beautiful patterns. A few pieces are zoned crystal fragments that when broken display the popular "V" shaped pattern known as "chevron amethyst." Look at the photo at the top of this page to see a few "chevrons." These make beautiful tumbled stones. Crafty people use tumbled stones of banded amethyst as attractive pendants, pocket stones, key chains, accents for potted plants, display gems for their homes and much more. This banded amethyst is mined in Namibia, a country on the western coast of southern Africa. Namibia is a difficult place to live or explore for gems because much of it is covered by desert. It is one of the remaining parts of the world where a wide variety of semiprecious stones are still being found. Here are some pieces of our rough banded amethyst that were tumbled using the Rock Tumbling Recipe below. Coarse Grit Step: Fill the barrel 2/3 full with a mix of 20% media and 80% banded amethyst. Add two level tablespoons of coarse grit per pound of material and cover the rocks completely with water. Then tumble for two to four weeks - or long enough to shape and smooth the stones. Amethyst is one of the top ten most popular gemstones across human history. It is found in many parts of the world and is abundant enough to be relatively inexpensive. People love its purple color. Few other gems compete with amethyst on purple color or on price. 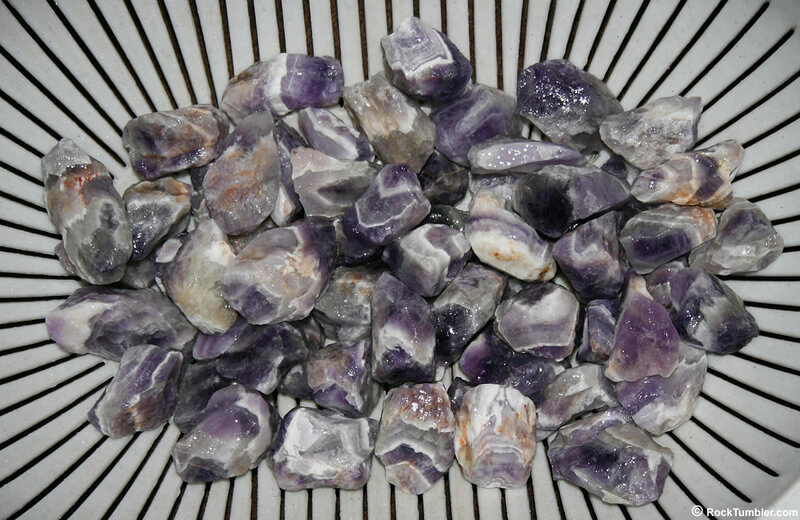 We usually have medium-size (5/8" to 1") tumbled stones of banded amethyst for sale to anyone who would rather purchase finished stones than run a tumbler. You can find them here.